« Skype with an Author on World Read Aloud Day! I’ve been getting lots of emails and tweets and general pokes about when HIDE AND SEEK, the sequel to CAPTURE THE FLAG, will be available. The answer to that question is April 1st – less than two months away! The book is available for pre-order now, through your favorite bookseller, and Scholastic just sent me a few more advance reader copies, so I thought it would be fun to give some away for CAPTURE THE FLAG fans who aren’t feeling all that patient. To enter the drawing, just leave a comment on this blog post with your name & a way to reach you if you win. I’ll draw a winner on Friday, February 15th – so let’s say that the deadline to enter is 11pm EST on Valentine’s Day. “Like” my author page on Facebook. “Like” CAPTURE THE FLAG on Facebook. Tweet a mini-review of CAPTURE THE FLAG. Share your review of CAPTURE THE FLAG on GoodReads, Amazon, & Barnes and Noble. Do some other creative, great thing to spread the word about CAPTURE THE FLAG and HIDE AND SEEK. Whatever you do for extra chances to win, please just leave a comment here letting me know. Total honor system here. If you think it’ll help more mystery lovers discover the Silver Jaguar Society series, then go for it, and I’ll toss your name in the hat an extra time or two. Or ten. And finally, if you’re a teacher or librarian who does something cool with your whole class, let me know and I’ll enter you for for a separate, special teacher/librarian giveaway. Giveaway rules: Books can only be shipped to US addresses. If you’re under 13, please have an adult enter for you. Deadline to enter is 11pm EST February 14th. Winners will be announced here on my blog on Friday, February 15th. I love capture the flag so much! My friend and I even made a book trailer for it when we had to read a mystery book for ila! If you want to watch it go to Its kinda bad…but we got an A! Anyways, I love this book and am so excited there is gonna be a second! I cant wait! I can hardly wait until April 1 for Hide and Seek! I just loved Capture the Flag. It is making the rounds in my 5th grade classroom. We all squealed with delight when we saw it in February’s Scholastic Book Club! They will be so excited to hear that the Silver Jaguar Society is back! Who am I kidding, I am so excited for this as well! Can’t wait for Hide & Seek! Would love to pre-read before the Dublin Literacy Conference at the end of February! I liked your author page! I liked Capture the Flag on Facebook! I am really excited about Hide and Seek! I book talked Capture the Flag in my fifth grade class and I don’t think that it has returned to the book shelf since! The kids love it (as well as Eye of the Storm). I have already posted a review on Goodreads. I will tweet when I finish this comment. I love your books and especially how you are always helping teachers! Also I liked both your Facebook page and the Capture the Flag page. I also requested that the Fairfax County Public Library order Hide and Seek. Tomorrow I will also put in a request that my school library order it. I’m reading Capture the Flag now and will review it in my children’s book review column in May for California Kids, a Sacramento regional parenting magazine. Love it! This Vermont fan would LOVE to have an advanced copy of your book. There’s a gullywhamper of a storm coming, which means I’ll probably be housebound for a bit, which means that cabin fever is likely to set in (it’s already been starting). 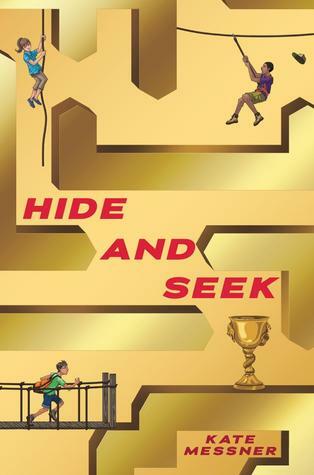 So – having and advanced copy of Hide and Seek to distract me would be a Godsend! It could be just what is needed to stop me from going completely insane waiting for winter to end! Please, please, please choose me! My fifth grade boys loved Capture the Flag and have begged me to order Hide and Seek. Would love to share and ARC with them. Love all your ideas to share and am doing most- talking my husband into the tattoo 😀 thank you for sharing your amazing writing talent again and again! My fourth graders and I are about half way into Capture the Flag. We are loving it and they would be thrilled to win the sequel. I have a stack of reader’s response pieces to read this weekend. I will plan on posting a few on my blog in the near future. Many thanks for the opportunity. ~ Theresa A. Loved Capture the Flag! Can’t wait to read Hide and Seek! I read Capture the Flag with my kids and we loved it! Can’t wait to read Hide and Seek with them! My daughter made a book report about Capture the Flag and all her classmates want to read it!!!! My oldest daughter and I read Capture the Flag together last year and blogged about it. We are SO excited for Hide & Seek! I have tweeted, mentioned on Fb and liked the book page. I haver CAPTURE THE FLAG on hold so not sure I’ll have to time to review it. good luck with HIDE AND SEEK’s release. I have several 5th graders in my class who loved Capture the Flag. I, too, can’t wait to read Hide and Seek! Love your books! I recommend it all the time at our library! Can’t wait for the sequel. I “Book Fairy” books (book talk and donate) to my daughter’s class, and they loved CAPTURE THE FLAG. I can’t wait to share HIDE AND SEEK with them. Good luck with the launch! I’m doing Capture the Flag as a read aloud right now. My class loves it! Can’t wait for Hide and Seek! I liked you on Facebook and also liked Capture the Flag on Facebook. Also pre-ordered Hide and Seek for my school! A 7th grader and I are lamenting the LONG time til April 1st…..would love the sequel early!! !